Our goal at Rafter D Ranch is simple; offer a quarter horse that is capable and willing to do the job you ask. Our selection of time-proven quarter horse bloodlines including Hancock, Blue Valentine, Driftwood, Zan Parr Bar and Leo provide excellent, versatile prospects for ranch, arena or trails. With the inclusion of cutting and reining influences from Shining Spark and Playing Stylish, we have quarter horses that could go to the show pen as well. 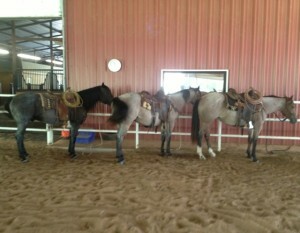 We have a large covered arena which allows us to ride our quarter horses consistently in all weather. We welcome you to visit us at Rafter D Ranch. Our hours are 7:30 am to 5:30 pm Monday through Friday. Please call ahead to schedule an appointment.